The Treasury and Internal Revenue Service recently finalized regulations for the 20% qualified business income (QBI) tax deduction for small businesses introduced by the Tax Cuts and Jobs Act. Most of the proposed regulations are unchanged. The final rules add a safe harbor designation for rental real estate businesses to qualify for the deduction. In general, the 20% deduction applies to net business income from pass-through entities such as sole proprietorships, partnerships, LLCs, and S Corps. The deduction can also apply to certain income generated from trusts and estates. Overall, the final regulations maintain most of the provisions first introduced in August 2018. The regulations prohibit the so-called “crack and pack strategy.” In this action, a specified service trade or business (SSTB) would attempt to split out non-service aspects of operating the business (real estate, administrative personal, etc.) into a separate LLC to qualify for the QBI deduction. Other anti-abuse rules prevent the use of multiple trusts, the classification of employees as independent contractors, and other actions. The regulations introduce a safe harbor designation for rental real estate businesses. See IRS Notice 2019-7. To qualify, a business owner must spend a minimum of 250 hours annually on activities related to the rental business. Owners may aggregate similar types of rental properties to meet the requirement. Triple net leases (where the tenant pays the taxes, insurance, and maintenance) and rental of vacation property are not eligible. Some examples of eligible activities include advertising, negotiating leases, and collecting rent. In addition to the activities of the business owner, those of employees and contractors could also be eligible. Travel time to the properties would not qualify, for example. The rental business must maintain detailed records. Business owners do not have to utilize the new safe harbor to qualify for the QBI deduction. Owners can make their own case that the business qualifies under existing tax law. The rules link the definition of a trade or business qualified for the QBI deduction to IRC Section 162 (trade or business expenses). Additional details include the definition of an SSTB. For example, veterinarians would qualify for this designation. 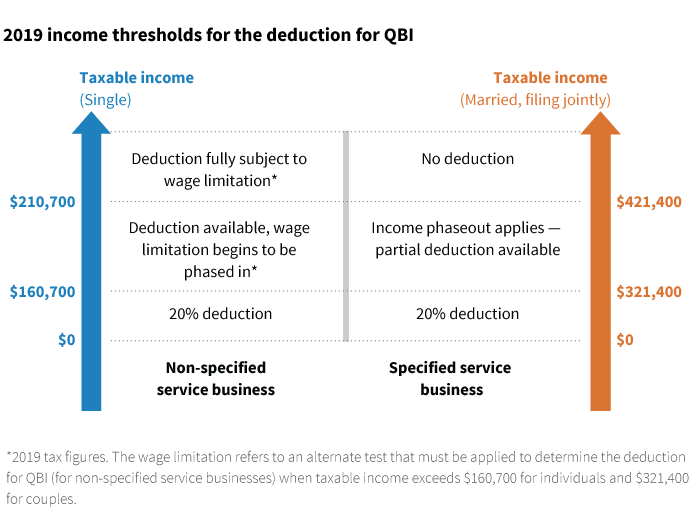 For purposes of calculating the QBI deduction, non-SSTB businesses owned by related parties can be aggregated. This provision could provide more favorable results for businesses subject to the W-2 wages and cost basis tests. Aggregated businesses must provide related services. For example, an owner of a restaurant and a separate catering business could aggregate those entities.